And get this: they are vegetarian. Oh oh oh actually… I guess they are vegan! While I’m used to my pinto beans with a large side of bacon, these totally rocked my world. So delicious and packed with flavor. Recipe is on the Tasty Kitchen Blog! Get it. 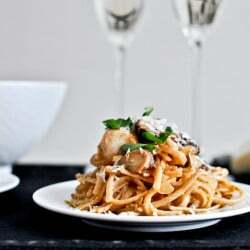 Brown Butter Parmesan Chicken Linguine. Awesome! I can’t wait to make these. Thank you! Yummy! Thanks for the recipe link! homemade re-fried beans are the.bomb! These make my world go ’round. I eat them sooooo often! Interesting! I am so lazy, I just make beans from a can! Lol, I’ll check ya out on Tasty Kitchen! Have a great weekend! Nothing beats homemade refried beans. Delicious! oh my gosh i love refried beans – living in texas i eat mexican way too often!!! Beautiful beans. Homemade is the best when it comes to beans! I don’t think I have ever had the patience to use dried beans to make my refried beans, but I am sure it’s way better then the canned beans! I will have to check it out! Ooooh refried beans – a necessity when it comes to mexican food meals! Mmmm I LOVE homemade refried beans. I make them all the time because with my rice cooker, cooking beans is a breeze! These smell so good in the house when they cook. I’m pretty excited to try this…I heart refried beans. Home-cooked beans are the way to go. I cook my beans in the slow cooker, makes for easy cooking. Very little stirring and no burnt beans! The flavor of home-cooked beans is superior to canned. OHHH these look delicious! And actually healthy :) I usually like my refried beans as a side to cheesy, chicken enchiladas, but I am loving this healthy version! Thanks for the laughs everyday! New font? I haven’t changed the font. I’ve always made my beans with ham but I want to try this vegan version. It sounds so delicious. I will make one suggestion though–try this with black turtle beans. They make the best refried beans ever. I will be making this soon! My family likes them spicy so I might add a couple jalapenos. Thanks for the recipe-it sounds wonderful! I wanted to make homemade refried beans with some dried pinto beans I found in the pantry this week! I’m glad I found this!! Looks amazing! Oh my gosh these look so good and simple. Thanks! YUM! Need these in my life. Also, I need to make nachos. I am loving all the bean recipes lately! My hubby and I are trying to conceive and I am trying to get as much natural folic acid as I can! I only know a couple bean recipes and I am already tired of them – I’m excited to get a little more variety. The beans are simmering away at this very moment… I added bacon! YUM!!! The house smells so. good.